Sixteen years seems like a long time to spend in school. Teens often lose their motivation to keep trying and excelling. As a parent, you want to know how to keep your teen motivated so they will do more than graduate. You want them to excel in school so they have the best chance at a successful life. One way to help your teen stay motivated in school is for you to continue taking an active role in their education. They may complain to their friends about you but they inwardly enjoy having you involved. If they’ve been struggling in one subject, show them how to set targets or goals which will bring those grades up. Can they study more effectively? Should they cut out extracurricular activities until they raise their grade? Assist them in setting specific, measurable goals and they’ll be more motivated to succeed. Ensure their school work is done and they meet all educational deadlines. They may not seem to be interested in whether or not their homework is completed on time, but chances are they really do care. Encourage them by helping with problems they don’t understand but don’t do their school work for them. Praise them for a job well done. Grades may not seem to mean much but they are an indication of how well your teen is paying attention in class and how well they’re keeping up. Don’t fixate on the actual grade but applaud their effort. Let them know you love them and are proud of them even if they don’t bring home an A in every subject. Explain to them how important a good education is for their future. If your teen applies themselves in school now, they will have the foundation they need to apply for nearly any entry-level job. If your teen isn’t sure what they “want to be when they grow up,” you’ll want to tell them how doing well in school will open doors for them, whereas goofing off in school can adversely affect what type of job they can get after graduation. Suggest they develop a good relationship with their teachers. Rather than seeing their teachers as the adversary, teens who develop friendships with their teachers actually can find someone to cheer them on for years to come. They may even be able to establish a mentor relationship which will greatly influence their future educational decisions. Is your teen afraid of the future and that’s why they don’t try harder? Facing graduation and what the future holds can be scary. Do they have a learning disability? Are they afraid of failing? Do they lack self-esteem? Are they simply unsure of what they want to do with their life? Encourage your teen to talk about what concerns them so you can help them move past it and look forward to what the future holds. If your child is unmotivated because they don’t know how to study, you can help them with this. Perhaps you struggled when you were in school so you’re not sure what you can do. There are organizations which can show your teen how to be more organized, teach them how to study so they do better in school and even tutor them to help them catch up. 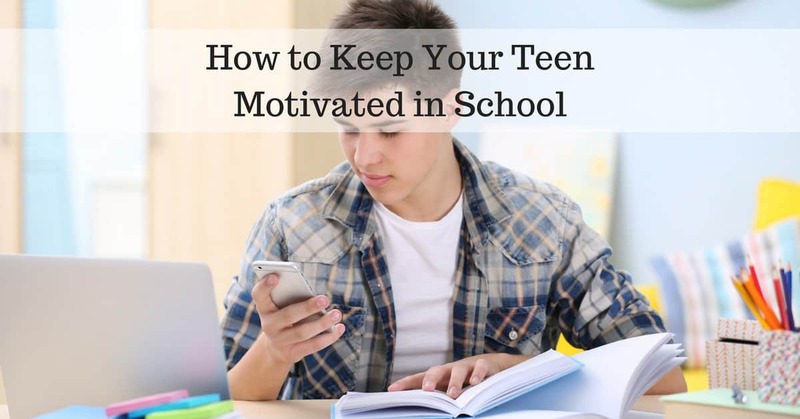 Knowing how to keep your teen motivated to work hard in school is important for their future. Help them succeed by using the tips above. When your teen realizes how interested you are in their future you may find that they become more motivated as well.